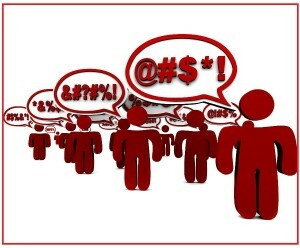 Four-letter expletives accidentally overheard or willfully overdone, deleted and undeleted, including F-bombs, once only thinkable—not utterable—in most public arenas, are now commonplace [where not already the dominant, if not exclusive, idiom]. Paralleling the decades-long mass erosion of civility and decorum, this explosion of obscenity makes the single F-bomb dropped in Beat-poet Alan Ginsberg’s 1957 poem “Howl” [which entangled him in a Federal obscenity trial] now seem yawningly tame and all TV programming before1960, like the super-popular “Mama”, “Father Knows Best” and “Leave it to Beaver”, painfully lame. So, what happened? Why such a massive shift toward F-bomb freighted and other !#@! communication—and why among the pre-employed young and on-the-job adults, irrespective of collar color? 1. Androgyny: It’s fair to speculate that one factor driving the wider use and acceptance of F-bombs is the masculinization of female speech and behavior in various cultures, e.g., the English-speaking world, as a step toward linguistic and other androgyny—a blurring or blending of male and female traits, including physical appearance, behavior, and domains—in an individual or species. Such masculinization of language has more than one manifestation: One Australian study compared recordings of young Australian women in the 18-25 age group, reciting passages from Shakespeare in 1945, with recordings of the same passages read by women, 18-25, in 1993 and found that, on average, the pitch of young women’s voices had dropped significantly over the years, more closely resembling male voices. To the extent that the drop blurred the vocal boundaries between males and females, it was, like gender-blind use of obscenities, a kind of androgenization. In fact, that brake is replaced by an accelerator, when the confirmation and exercise of female equality appear to be best accomplished by dropping an F-bomb, now a commonplace occurrence in all-female as well as mixed groups. 2. Dumbing-down by design: It can be argued that, like much of pop culture, the exaltation of expletives at the expense of more precise, accurate and enlightening communication, serves the dark purpose of dumbing us down, e.g., to make us more malleable, less discerning, less aware and less critical consumers, workers or citizens. As Edward L. Bernays, nephew of Sigmund Freud and the father of propaganda and PR, explained in Propaganda, a truly critical populace would be both ungovernable and unsellable, paralyzed by endless squabbling deliberation upon and sorting of countless competing ideas, products and policies. As that population expands and comes to resemble an ever-bigger Tower of Babel mob, such critical awareness threatens chaos of discord, dissent and indecision. So, Bernays argued, to streamline political, cultural and economic life, simplification or elimination of thought [through the skillful use of propaganda and snappy slogans] is a useful, indeed inevitable, step. Examining any four-letter bomb, you’ll find that, if you were to translate it into the underlying articulated rationale—when there is one— for using it in any given situation, you’d learn a whole lot more and be less uncertain as to what prompted it. But that requires thoughtful thinking, of the kind propagandists and controllers want to discourage. Imagine calmer, more reflective, patient, detailed and polite roadside discourse instead of the unleashed 4-letter fury of road rage. Likewise, being told that your resume or social media networking is “crap” [which barely nudges the vulgarometer] is a shabby hot-bullet substitute for a detailed enlightening ray-of-light critique. In other words, F-bombs and their ilk are designed to shed heat, not light and to replace thought with feeling—in virtually every instance. So, more feeling than thinking means less engagement of the mind and the morals—of either the speaker or the listener. Crudity also means a more limited, far less nuanced vocabulary that, in its most extreme instances, perpetuates the unthinking habits it manifests, usually by replacing clear, abstract, empirical and logical thinking with standardized, metaphorical, vulgar, persistent and always-puzzling references to body parts and functions. Through its use of F-bombs and other profanity, the entertainment industry doubles down on dumbing down: First, it dumbs us down with dumb content devoid of depth, insight or relevance; then, having turned off the light, it has to turn up the heat. So, we end up with endless and mindless car chases, crashes and F-bombs to narrate and embellish them. The office may not be as entertaining or adrenalin-pumped as an action movie, but it can follow a similar dumbing-down script and agenda. For example, if a boss, dissatisfied with staff performance, explodes with a tirade of expletives, [s]he’s, of course, saving time and energy, and capitalizing on the intimidation effect of expletives—or so imagines. But this can also be a deliberate or unconscious dumbing-down tactic—to inhibit reflection, discussion, analysis, negotiation, etc. It also explains why we never say, “If you can’t take the light, get out of the kitchen.” It’s the heat that seems to matter to and control us more. The potty-mouth boss or office bully knows that. 3. Use of disrespect to win respect: At some point after WWII, many Americans seemed to begin to think that winning respect from everyone and anyone is not only necessary but also can be achieved [primarily] by being blatantly disrespectful and using what was initially taboo language whenever they wanted to. After all, only someone who could “get away with it” would use it—and that person must, of course, be powerful, important, avant-garde, independent, anti-hero, good-looking, rich or cool enough to do that. As objective justifications for the respect sought and believed deserved—including because one has a fantastic job, career pride and advancement, accumulated wealth, distinctive accomplishments, special qualifications and stand-out identities—have become harder to achieve and produce, the need for that respect has become more desperate, more intensely felt, driven by mounting frustration, and more relentless. Hence, the bizarre F-bomb-laced demand for respect from thug low-lifes, e.g., hockey rioters, who deserve it least. With anger and frustration in the mix, you get a perfect powder-keg for F-bomb detonation. It’s an explosive combination of an unmet need for respect + anger + frustration + empowerment or permission to be disrespectful. Post-WW II generational marketing to teens and tweens, trumpeting their privilege, purchasing power and social entitlement, has done nothing to prevent, damp or reverse this or to suggest that talking to one’s parents that way is somehow not right or anything but “cool”. By contrast, within the client-professional relationship, respect is still generally won the “old school” way: politely, civilly and decorously, especially when the professional isn’t the boss, and while the client in the office is. That’s perhaps why it is a virtual certainty that not a single profanity will make its way into an S.A.T, Myers-Briggs, G.M.A.T., L.S.A.T., bar exam or Miller Analogies test—tests designed to assess intellectual and professional competencies and suitability. In instances when the boss, gangsta rapper or stand-up comic F-bombs others, it may reasonably be inferred that the purpose is to win respect by demonstrated privilege, right, immunity, impunity, intimidation, generational solidarity, visceral authenticity or the confident unconcern of a dominant—which are estimated by the mouth [if not the brain] to more than offset the appearance of coarseness or unsophistication. Revealingly, in various professional settings, the risks associated with such power moves are, despite the appearance of uncontrolled spontaneity or impulsiveness, very carefully calculated, with a green light to go for it only when it seems safe. For example, Comedy Central’s otherwise expletive-festooned parody-news hit, The Daily Show with Jon Stewart, dramatically tones things down in its interview segments—often because of the “seriousness” of the topics and the power and influence of the guests, e.g., Senators, authors and A-list celebrities and, more generally, because of their “client”-guest status. Interestingly, the Daily Show’s on-the-job supporting characters, e.g., Samantha Bee, obscenely savage those they interview, even when they are interviewing powerful, albeit mocked and derided, politicians, organizational spokespersons and bureaucrats. This is quite unlike what happens with host Jon Stewart [or the equally brilliant Oxford-grad John Oliver, who recently filled in for Stewart] when in interview mode. In those high-profile interview segments, the tone is deferential and polite, more like a staid Edward R. Murrow 50s interview or an ordinary sit-down between a lawyer and client. Obviously, the reason for the difference and lack of deference in those hatchet interviews is that indeed this is what they are expected to be: hatchet jobs on interviewees—not guests—being held up to ridicule. Hence, professional potty mouthing is not entirely uncontrollable, despite any appearance to the contrary. In fact, despite whatever appearance of spontaneity or habit fusillades of F-bombs create, they are, in general, and not just in programming, carefully calculated and calibrated with respect to context, audience, degree and impact—just as we all, except the truly unhinged, carefully select to whom and to what level we dare vent our anger. It may be speculated that, psychoanalytically speaking, the swinging of the parenting pendulum toward permissiveness allowed contemplation of the possibility that parental figures could be challenged, or at least not revered, in an unconscious uptick in the Oedipal battle for supremacy. Indeed, anti-war youth protests of the 60s and 70s, and the audacious outing and displacement of the penultimate American father figure, the POTUS, Richard Nixon, by young Spock-era journalists suggests there may be something to that conjecture. Ditto for the increase in blasphemy and religious parody. When F-bombs are shocking, what better way to disrespect and challenge the power establishment and parents than to verbally blast them off their pedestals, using language that either they would never use or which you can co-opt? It’s hard to imagine an “F”-laced outburst at a 19th-century Prussian dinner table presided over by a stern mustachioed Watsonian patriarch who looked and acted like the Kaiser. Of course, both the Prussian and the Norwegian-immigrant “Mama” TV family were fundamentally patriarchal or duumvirate [rule by two] in structure—the father being the sole breadwinner and dominant power figure beyond challenge, with Mama being the full-time day-time disciplinarian. Even when led by parents as generally gentle as “Lars” the father and “Mama” in the “Mama” series, these families were, above all, discipline and decorum focused, with a stronger emphasis on the privileges and limited permissions of children than on their indulgences, entitlements or [imagined] grievances. In contrast to what happens in many modern households, an unthinkable dinner-time F-bomb dropped by one of their kids in 1911 would have precipitated either a heart attack or wooden-spoon smack based on a venerable, quintessentially American tradition and conviction. That the parental 2nd-amendment right to bear and smack arms trumped a child’s 1st-amendment right to “free speech”.